Miamai announces a changing of the guard by wishing Winter Jefferson a fond farewell and welcomes Shae Sixpence as Chief Marketing Officer. Winter served as CMO of Miamai for years, in a relationship that brought the brand some of its best moments; a relationship that became more and more based on a great friendship and a common sense of beauty and style. 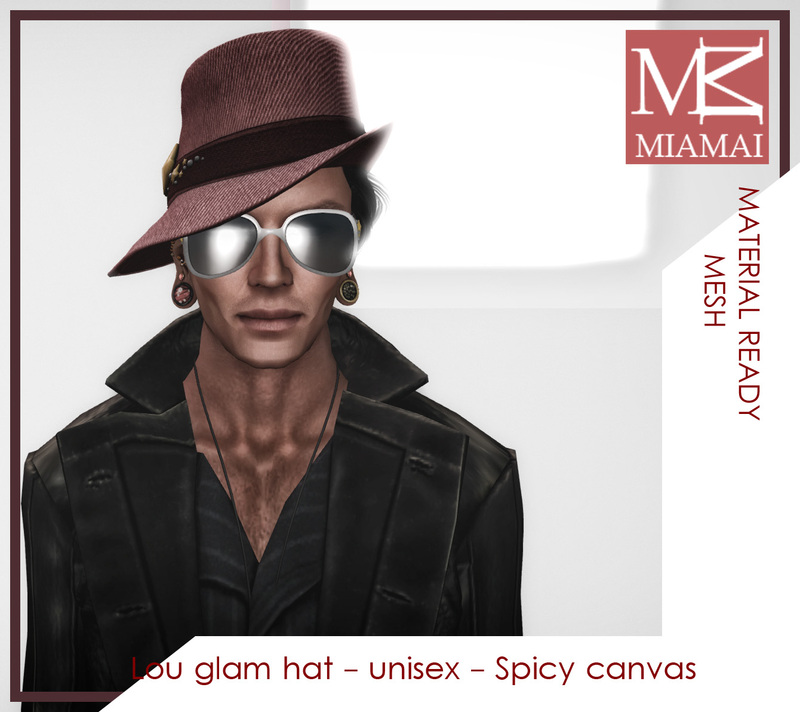 It has been an honor to work with my best friend bringing my visions in Second Life, and to have his support and knowledge of the fashion industry helping me to develop Miamai to the brand it is today. Without his insight my biggest and more visionary project, the Black Label Collection, would still be a glimmer in my mind. But all the great minds deserve some rest! As Winter takes his time off to recharge and discover new horizons and new dreams we are more than happy, excited and eager to work with Shae Sixpence. She has been in the Second Life fashion industry as a Model, Miss Virtual World Brazil 2011, brand manager, event producer, photographer and content creator for four and a half years, and I had the chance to work with her lately, both on “The Golden Thread” show, and by creating a dress for her as her position as Host of the Miss Virtual World 2014 finals. Both of them have been a beautiful experiences and let all of us at Miamai know her sparkly funny personality, along with her professionalism. We are eager to see what will happen with such a force in our team, and what the future holds for us! This is also my occasion for a late welcome to the marketing team to Kalia Anatine. She joined our staff during a time of need and without hesitation gave the brand the immediate attention it needed. She didn’t get the official welcome party that she indeed deserved, but she proved her worth in the few months she has been with us. She has the ability to reach out to our customers .. providing them with a new and fun way to connect with us .. helping them to discover what we here at Miamai have to offer them … combine that with her incredible working stamina and we are proud to add her to our team! And now, let’s eat some cake! Babai! … The Golden Thread …. The creatives of MIAMAI have gathered together for the fourth year of their triumphant Black Label series of fashion events. Join us as the year closes and wind your way into the forests of the night. 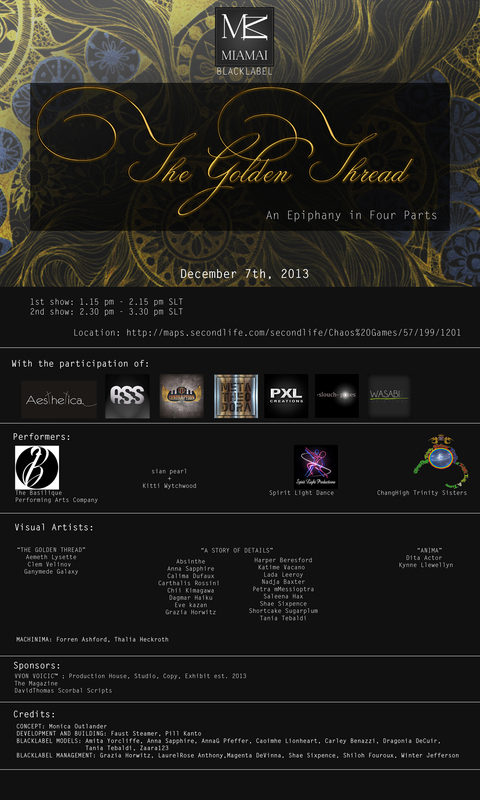 Come, follow the Golden Thread on a journey that will take you to the heart of life and love. 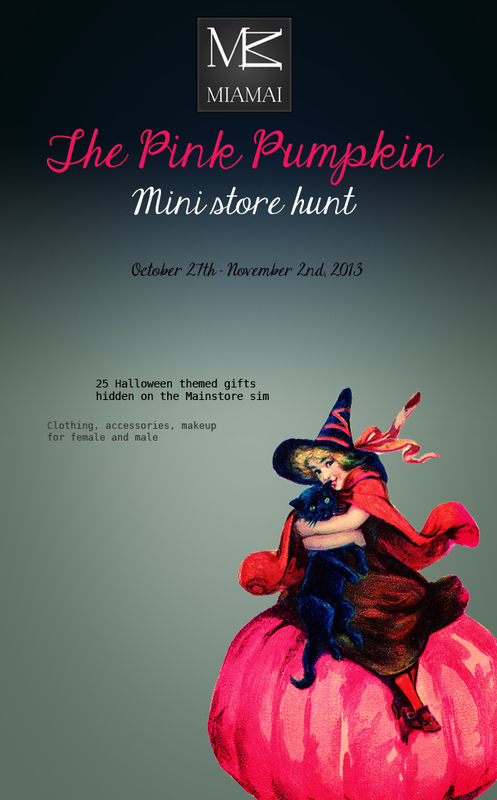 Every attendant will be required to wear a mandatory outfit that will be provided upon reaching the event location. After the event, the venue will be open to the visitors for a month. 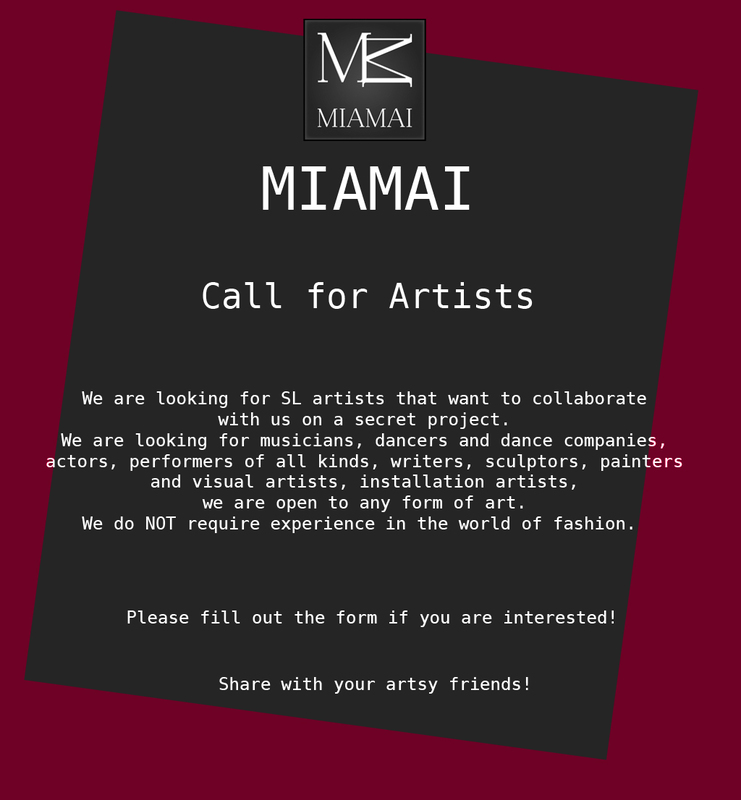 We are looking for artists that want to collaborate with us on a secret project! Musicians, dancers, aerial dancers, whimsical dancers, poets, writers, actors, performers, visual artists, sculptors, installation artists, the more the merrier! And spread the voice, we are excited to meet wonderful creators!